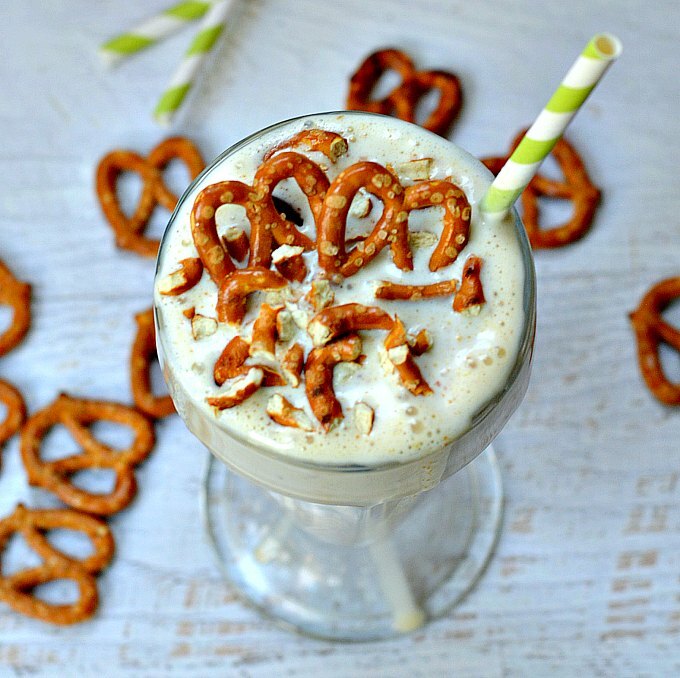 Try a new twist on your homemade peanut butter milkshake recipe – with pretzels! I love milkshakes and malts. In fact, I rarely order ice cream cones or sundaes if a shake or malt is an option. My son loves them too and always order the ice cream he can drink. I’m usually somewhat of a traditionalist when it comes to milkshake recipes, though, favoring strawberry. But I’ve recently become obsessed with peanut butter milkshakes. 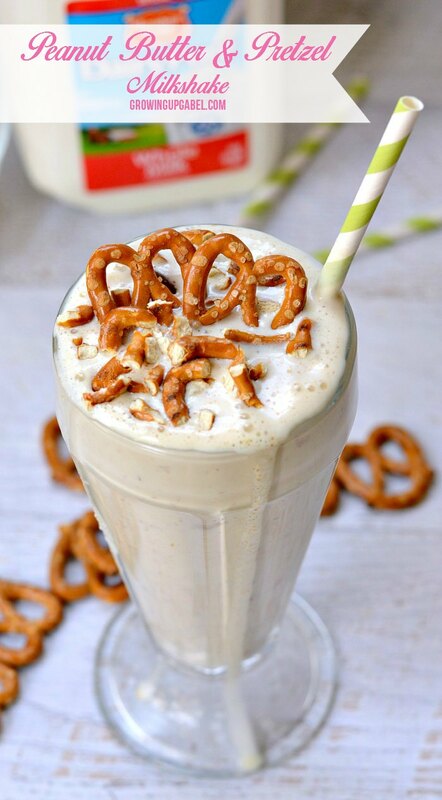 I was at a restaurant and noticed their milkshake of the month was peanut butter and pretzel and I had to try making one. The ingredient list for a milkshake recipe is pretty simple – ice cream and milk and then whatever flavor you want. 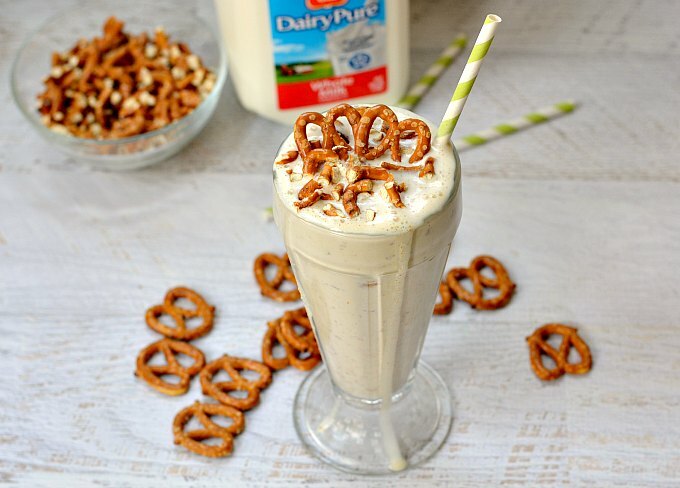 For this peanut butter and pretzel milkshake, I used the new DairyPure milk. 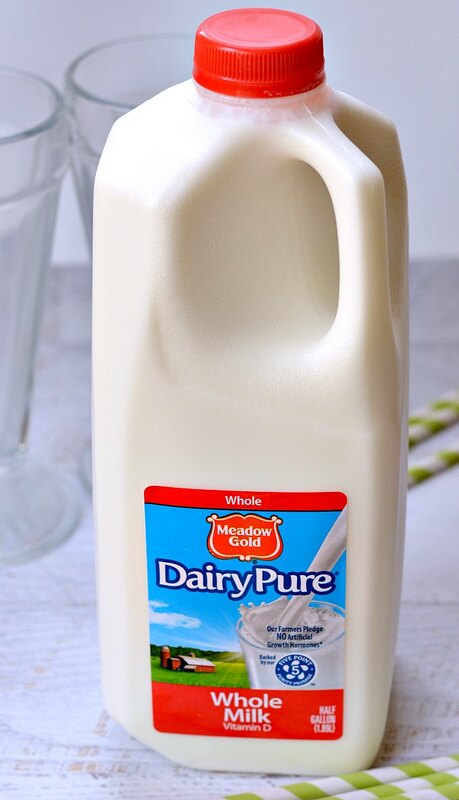 DairyPure is only from cows fed a healthy diet. The milk is continuously quality tested to ensure purity. It doesn’t have any artificial growth hormones,* is tested for antibiotics, and is cold shipped fresh from your local dairy. Grab the DairyPure Milk, your favorite brand of vanilla ice cream, peanut butter, and chopped pretzels. 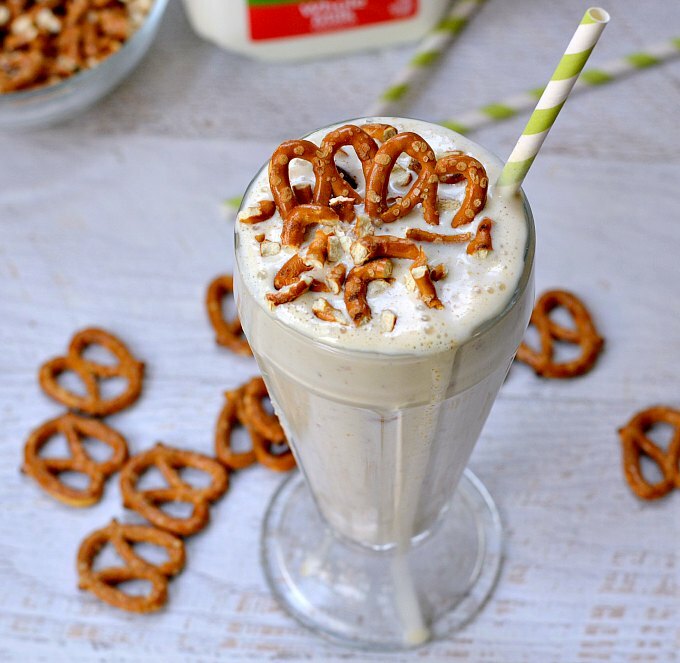 Make sure most of the pretzels are chopped small enough to fit through a straw or just plan to use a spoon to finish off the milkshake. In general, when making a milkshake, more ice cream than milk is used. My mom used to make us chocolate malts all summer long and I was shocked to discover just how much ice cream is used to make milkshakes for an entire family. So stock up on ice cream and be glad you can save some milk for breakfast in the morning. Making the milkshake is super easy. Put the milk, ice cream and peanut butter in a blender and blend. Stir in the pretzels once the milkshake is the desired consistency. Then enjoy! You can substitute almond or another nut butter to avoid peanut allergies. Or throw in fresh chopped strawberries instead of the peanut butter for a strawberry milkshake. Of course, a little chocolate sauce will create the ever favorite chocolate milkshake. So tell me – what’s your favorite milkshake flavor? 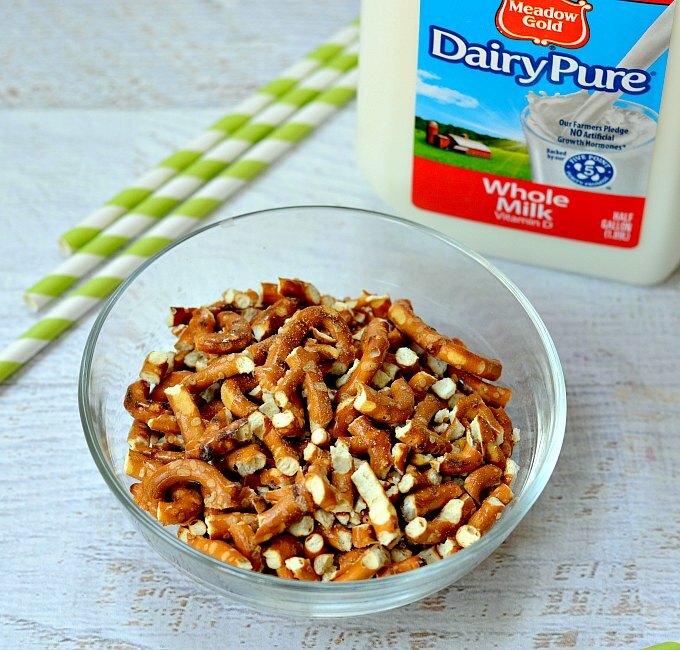 Learn more about DairyPure and check out DairyPure Recipe inspiration on Pinterest. You can also find DairyPure on Facebook. Blend together ice cream, milk, and peanut butter in a blend until smooth and combined. Stir in pretzels. Top with whole pretzels. Add chocolate sauce for a peanut butter chocolate version! This looks really incredible!!! I love peanut butter and pretzels!!! Thanks for linking this up with us at #foodiefriDIY! I chose you as one of my faves!! This looks yummy! 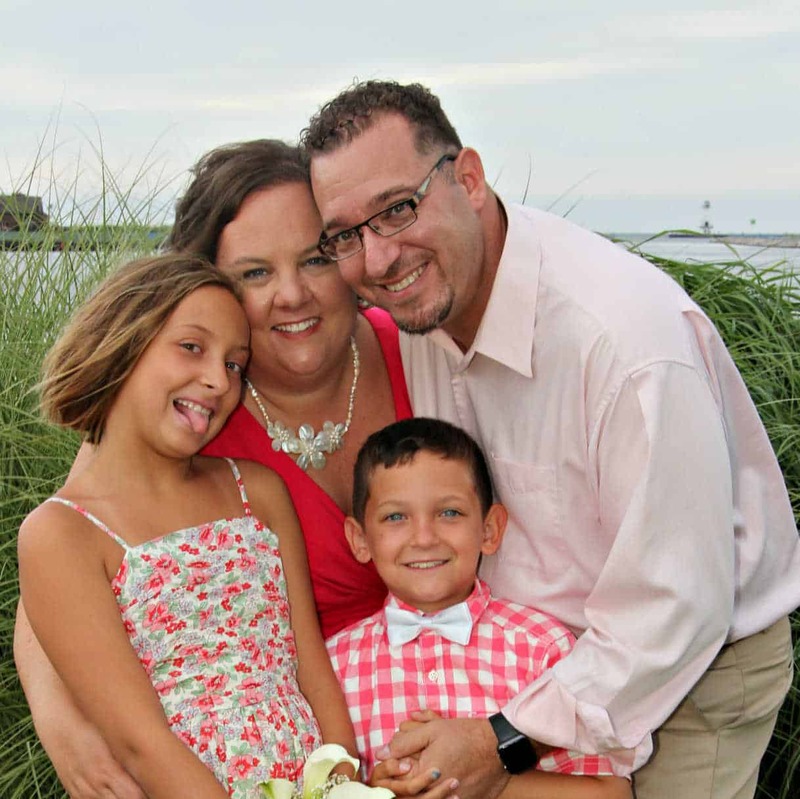 Thanks for sharing it at our link party last week! I have to admit…. I’m dying to try it out! Looks interestingly delicious! Thanks for sharing Camille! I love pretzels and peanut-butter, so this sounds AMAZING! 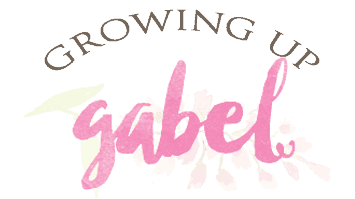 Thank you for sharing this at the #SmallVictoriesSundayLinkup! This recipe sounds absolutely perfect! I couldn’t imagine a more perfect combination than what you’ve put together…yumm!!! Oh my! I wish I would have thought of this combo when I had a milkshake bar at my little guy’s birthday! We’ll have to make more milkshakes soon! What a fun idea to have a milkshake bar! I love it! Yum!! Sweet and salty is so good. I am craving this now! Pinning and visiting Lou Lou Girls Fabulous Party. 🙂 Thanks for sharing. Oh my, this looks fabulous. I love the salty and sweet flavors together. This recipe is a ” have to try.” Thanks so much for sharing. Visiting from Ladies Collective Link Up.